With the end of the summer holidays fast approaching, so comes the start of a new school year. For many, it will be the chance to regale their friends with stories of their holiday adventures, and hear all about the exciting presents that were received over the Christmas break. For others, the new year is likely to be daunting, with a whole class of preps and year sevens starting a new chapter of their educational lives. The children starting secondary school have been through the process before (even if their memories of it are a bit hazy), but for the new preppies, this is going to be an unprecedented event- five days a week, away from the family, learning everything that the big kids do. To help with this transition period, some book companies have released picture story books that take children through the events of a day at school. Below are some of the offerings available to parents who may want to gift their child with a book that can help familiarise and ease them into the school system. This book is about a young girl’s first day at school (as you could probably tell from the title) but nothing about the school day is actually explained here- the entire book is about the getting-ready process in the morning. Our little girl and mum have breakfast, get dressed (including putting on new shoes and a hat for the sunny weather) and take a happy snap with mum’s smart phone to have a memento of the day. There’ll be new things to experience and new friends to make, but who’s more nervous about the first day of school? 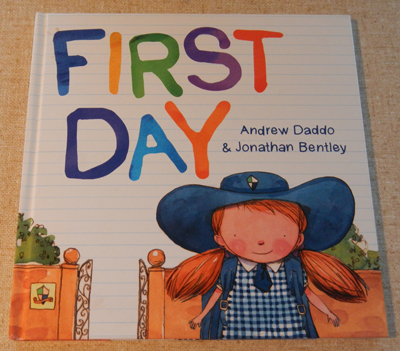 This is a cute little picture book, written by Andrew Daddo and illustrated by Jonathan Bentley, and parents are sure to recognise and appreciate the little twist at the end. This book is something of a classic, first published in 1984, but it still resonates with young audiences today. 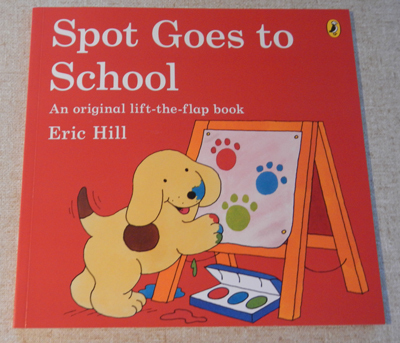 Spot is attending his first day of school, and it is filled with lots of fun activities- he gets to learn new songs, meet and play with new friends, have show-and-tell, paint pictures, learn how to spell, and listens to stories. When the end of the day comes, and all the parents are waiting for their children at the school gate, Spot is disappointed to leave, but he is happy to know that he can come back again the next day. The age-old ‘How was school?’ question that most parents ask is also featured in this book, with the typical student response, which just goes to show that some things don’t change much throughout the years (even if your protagonist is a puppy). 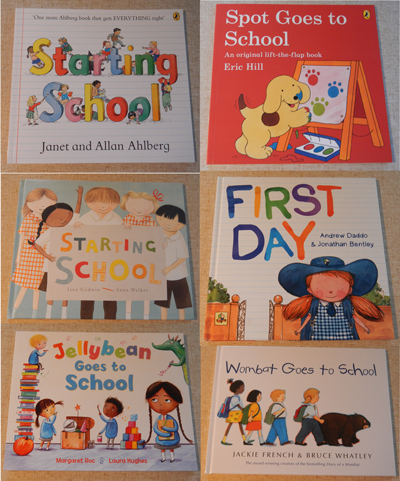 Jellybean is really looking forward to her first day at school- she can’t wait to learn how to read and write, and she really wants to know why clouds are fluffy and white. Most of all, she can’t wait to leave her little brother at home and make some new friends her own age to play with. But when the day finally rolls around, Jellybean is nervous, and decides that maybe staying at home with her family might be a better option. Luckily her mum, along with her new teacher Miss Benson, convince her otherwise. Along with her new buddy Alex, Jellybean is introduced to school life- they get to build towers with blocks and explore different areas of the school (including the music room, school garden, library, and maths/science area). After lunch, they get to do plenty of other fun activities, and before long it is home time. Jellybean has had a fantastic time, and can’t wait to get back into it the next day. 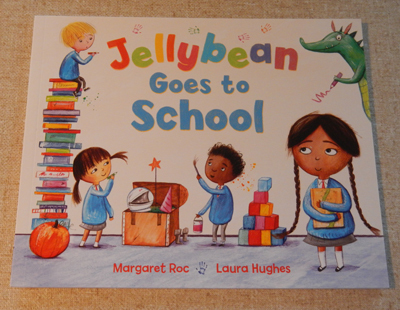 The illustrations in this book are just adorable, and children and parents alike will love the imaginative way that Jellybean sees each new school experience. This book is great for children who may be a bit hesitant about their first day- it will provide a little bit of encouragement for the weeks ahead. 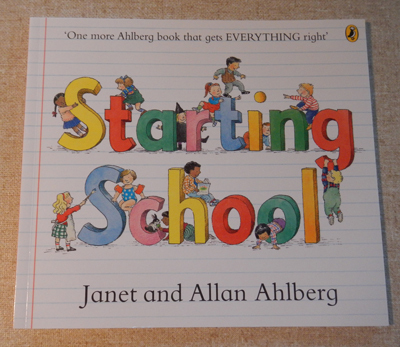 This book probably shouldn’t be called Starting School- rather, it should be called, The School Term or something equally descriptive, as more than just the first few days are mentioned here. The story follows the academic lives of Gavin, Errol, Sophie, Sushma, David, Kate, Robert and Alison as they start their first day of school, and progress throughout the term (until their Christmas nativity play and school holidays). Their activities vary throughout the book- some days they simply play and paint and learn to write. Other days they look after their class rabbit Ronald and swim in the school pool. They also learn to cook, go to assembly, have their school photographs taken and lose items like gloves and hats. The Ahlberg’s don’t sugarcoat the kids’ school experiences in honey, however. In an effort to keep it real, they show that school is not always fun- people (including the teacher!) can get sad, puzzled, grumpy and spotty (highlighting the likelihood of catching those dreaded chicken pox). This is a great introduction to how school life really is- through all its annual ups and downs- and will be popular with both children and adults. From the creators of the popular picture story books Diary Of A Wombat and Baby Wombat’s Week, comes a cute back-to-school edition aimed specially at children starting their first day of primary school. Wombat’s day starts just like any other- he wakes up, he scratches, he eats grass- but then he makes a discovery, finding a hole and tunnel! The inquisitive creature decides to follow the tunnel and ends up in a classroom, but all he can think about is his stomach. Following his nose in search of carrots and grass, he travels through the school grounds and among the school students as they have their lunches in the playground and attend their classes. He makes a new friend and visits the school principal, and before long it’s time to go home. Wombat has learnt a lot of things throughout the day, even if it wasn’t your conventional school day. What will tomorrow bring? 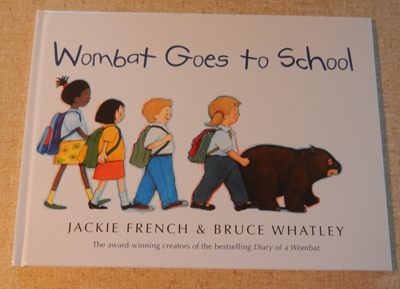 Whatley’s illustrations provide an amusing contrast to French’s text, and children will love the expressions on the faces of the students as they see Wombat ‘participating’ in the school activities (the reaction of the principal is also sure to get a laugh). This book will make the perfect addition to your Australian picture storybook collection. Children’s picture storybook goddesses Jane Godwin and Anna Walker have teamed up to produce this lovely chronicle of the first day at school. Rather than focus on the experiences of one child, however, they have featured the whole class (although five students- Tim, Hannah, Sunita, Joe and Polly- get a bit more attention than the others), helping new students to understand that everybody sees their first day in a different way. Each important moment of the day is set out, including getting to know people, snack time, the playground, touring the school and making class rules, among others. Readers will get to see each student grow and progress throughout the book- they will see who becomes friends with whom, which students are the quiet ones and which are more boisterous. They will learn that everybody is different, and everybody deals with life in their own unique way. 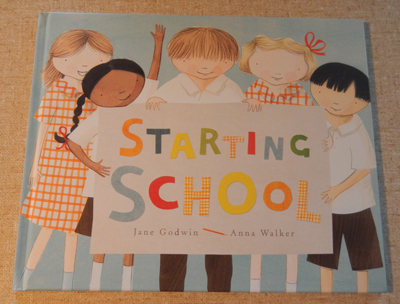 With Anna Walker’s trademark illustrations and so many things to look at, this book covers everything a new student needs to know about starting school, and is sure to become a firm favourite.